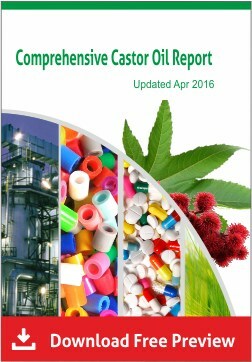 CastorOil.in brings you the weekly report of castor oil and meal prices at Bombay Commodities Exchange. Scientists from Brazil conducted an experiment to evaluate the replacing levels of soybean meal with castor seed meal in diets for lambs on the productive and metabolic parameters. The lambs were fed with varying concentrations of castor seed meal replacing soybean meal. The experimental setup was completely randomized with five treatments and ten replicates. The experimental results showed that despite the decreased intake, nutrient digestibility and nitrogen balance, castor seed meal could replace 50% of soybean meal without changing the lamb’s blood parameters or performance. Researchers at Brazil conducted a study to understand the effect of replacement of soybean meal by wet or dry castor bean meal in diets of feedlot lambs. They assessed animal performance, carcass traits, intake, digestibility and hepatic function. Control animals were fed with soybean meal while lambs for test were fed with dry or wet castor meal treated with calcium hydroxide for 70 days. Lambs were slaughtered and evaluated at the end of 70 days. Dry matter intake and digestibility, final body weight, average daily gain and carcass weights were not affected by the substitution of soybean meal by castor source. Serum levels of aspartate aminotransferase and alanine aminotransferase enzymes did not differ among treatments indicating no effect of treated CM on hepatic function. The results show that the castor meal can completely replace soybean meal in the diet of finishing lambs without negative impacts. 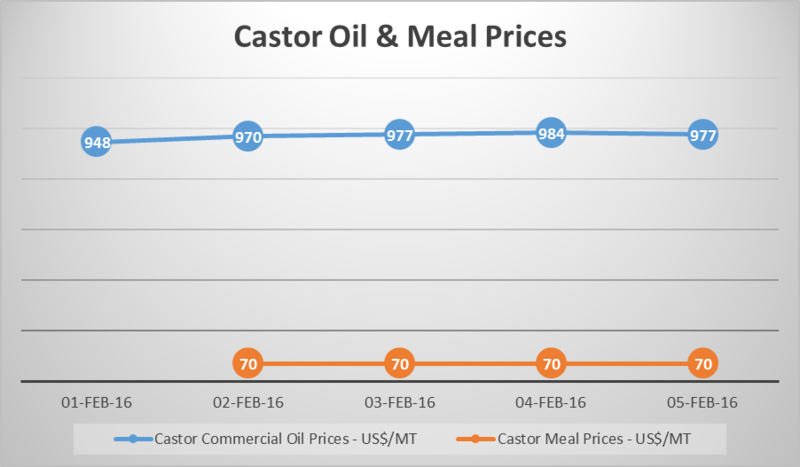 Castor futures moved up marginally on account of strong export demand for its meal in local mandis along with weak production estimates for the current year. However, spot traded weak. Since Wednesday, most of the APMCs in Gujarat will be closed for a week. Arrival of castor also halved and will decrease further. 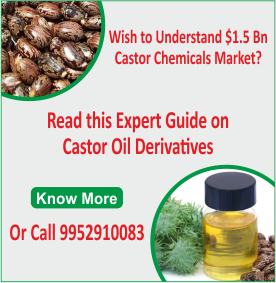 On the National Commodity and Derivatives Exchange (NCDEX), castor April contract increased ₹7 to ₹4,140 with an open interest of 155,800 lots. NCDEX May contract was up ₹9 to ₹4,208 a quintal with an open interest of 82,960 lots. On Rajkot Commodity Exchange (RCX), castor for June gained ₹20 to ₹4,243. RCX spot castor declined ₹12 to ₹3,959. 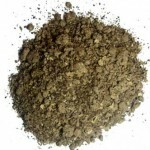 Data compiled by Solvent Extractors Association showed that the exports of castor meal during February reported a strong gain of over 254 per cent to reach 0.39 lakh tonnes against 0.11 lakh tonnes of the previous year. About 28,000-30,000 bags of castor arrived in Gujarat and prices stood at ₹770-790 for 20 kg. Around 900-1,000 bags arrived in Saurashtra for ₹745-780. 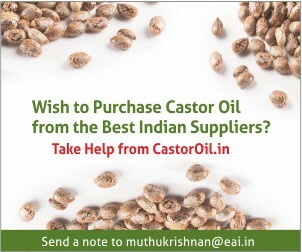 Castor oil increased ₹5 to ₹835/10 kg. According to Reuters, castor seed future March contract will decline owing to selling pressure from bear operators. Ricin toxin is a threatening agent with significance in global warfare. Scientists have been working in the development of several distinct analytical methods for the detection of toxin with improved sensitivity and specificity but they still tend to suffer from critical limitations especially under circumstances when direct immuno probe based protein toxin profiling was made in complex biochemical samples including food stuffs that resulted in ambiguities.It stood as one of the fundamental reasons which has diverted researchers to concentrate on genetic profiling of toxin in samples for precise interpretation. US scientists have now developed a technique called real time PCR which targets the genetic material in samples.They applied a genetic probe specific for the toxin in DNA samples isolated from milk and egg for generating a fingerprint.Experimental results showed that their probe functioned relatively well and was able to detect toxin at concentrations of 5ng per ml of milk or liquid egg.It was also reported that negative interferences from the samples were obvious but researchers were quite content with the level of detection of sub-lethal doses of toxin in biological fluids. It is interesting to watch technique such as this since the analysts were targetting the core biomolecule,DNA which permitted them to reduce the chemical complexity of samples by fractionation for convenient profiling. Nevertheless it is vital to note that advanced PCR systems are expensive and prone for producing artifacts, also demanding for skills in the preparation of quality samples and optimization of probes in the detection of multiple variants of ricin DNA from the genomic pools of biological sources standing at different loci. Ricin detection in biological samples is of great significance as the toxin is reported to be a candidate substance for intoxication in bio-terrorism, suicide etc.By classical methods people have exploited antibody based immuno probes for detection of test toxin in materials under observation.However it suffers from certain drawbacks including sensitivity,cross-reactivity,time and technical preparation.It prompted researchers around the world to surf for alternate probes in bio-sensor developments which can effectively circumvent these problems. Scientists from Japan have made use of natural molecular interaction behaviour of toxin and designed a novel probe to profile the toxin.By applying knowledge in ligand-receptor chemistry of ricin in biological systems,they have designed a synthetic analogue that acts as a ligand to toxin.It was immobilized onto a solid matrix to serve in stationary phase and ricin incubation was performed.The toxin bound to the test probe was assessed by a special spectroscopic technique Surface Plasmon Resonance(SPR) which indicated ricin at concentrations of 5 pg/ml in 5 minutes which the authours claimed as a benchmark in biosensor designing.The results obtained from this new probe were further validated by alternate methods for specificity. The experimental research work was exciting as a analysts have completed a broad study and generated promising results with cutting edge technologies in the qualitative and quantitative fingerprinting of castor toxin.A technique that is pointed in nature proportionately requires professional perfection for absolute analysis. Ricin toxin from castor is a dimeric toxin and initially synthesized as a toxoid but found to be processed in castor beans during the course of seed development.As the protein is localized in the cellular sub components, protein bodies of seed endosperm, researchers from UK have made their experimental investigation on concerned cell organelles of storage function for the detection of molecular factor with catalytic potential to transform the inactive toxin to its lethally active phase.Protein profiling was adopted after isolation and fractionation of crude mixtures from protein bodies to identify the specific target and the results confirmed the materialistic presence of an acid endopeptidase enzyme.The functional relevance for this enzyme over toxin transformation was evaluated by in vitro assays where active toxin release was noticed from its precursors. Scientists from this study were able to detect a key candidate acting as an accelerator of ricin toxicity and offered us a solution to target the molecular components in castor with flexibility for producing non toxic seeds instead of a restricted direct focus over the toxin.However it is vital to understand the specificity in this toxin-catalyst association for precise targeting to improve the application potential of castor crop. Ricin is a potent lethal cytotoxin derived from castor seeds and combatting its toxicity is a tedious task.Currently no effective antidote has ever been formulated so far and makes therapy difficult.It also places the victims survival purely as a matter of chance.As chemotherapy andd other mehods fail to produce productive results,scientists have started to employ vaccines as a possible tool to tackle the toxin. US researchers from Army Laboratory in Frederick have found a vaccine containing an inactivated toxin that selectively retains an activity to boost the immune system without inducing lethal toxicity to mount systemic defence response in the body by protein engineering princples and found to be effective on animal models.The US Army has reported that currently trials are underway in 30 human volunteers and plans to conduct clinical trials as well at Fort Detrick. Vaccines are powerful tools to produce solutions in a timely consistent and biologically safe way.Historical credits to vaccines in global health are something extraordinary with reference to pathogenic diseases and attempts such as this to focus on vaccine vehicles and expanding their horizon to toxins neutralization would most probably yield a fruitful result in future to address the problems of global threat from castor toxin. 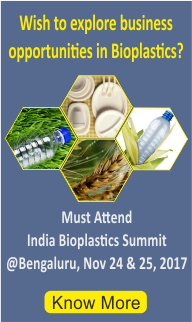 Plant systems are rich in secondary metabolites as they play vital roles in plant development, interactions, resistance to abiotic and biotic stress etc as regulatory activators and suppressors of signal transduction physiology to mount the preprogrammed response. Virtually any evolved plant is packed with a vast array of metabolites and is well studied in medicinal herbs and shrubs, agricultural crops etc. However analysis of such functionally potent molecules in castor seed debris is rudimentary. Secondary metabolites are broad category compounds and scientists of this study have chosen to characterize one of the principal categories, phenolics from castor deoiled cake.The phenolics being non polar in nature differential extraction of molecules in cake was made with methanol-ether bisolvent system and they ended up with a biochemical mixture. Spetroscopic analysis showed a strong absorbance corresponding to phenolics and further chemical disintegration revealed five principal compounds namely p-coumaric acid, ferulic acid, o-coumaric acids, syringic, and cinnamic acids . This is a remarkable metabolite profile for the presence of secondary metabolites. Eventhough the authors did not disclose the functional significance of them in seeds, it could most probably be associated with herbivore feeding deterrent activity.